As I mentioned before, I'm taking a spinning class. Let me just say that I am not the star pupil! However, I'm getting better, I think. That's wool that I hand-carded myself to spin. 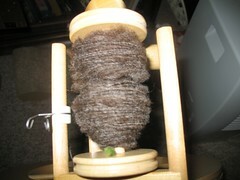 I think I find the "fluff" that hand-carding produces to be a whole lot easier to spin than roving. However, maybe it's because I'm finally getting the way spinning is supposed to feel. Tomorrow night is our last class, but I think I can keep the wheel until the next class series begins in September. If that's the case, I'll buy some roving in some pretty color and work on it a while. On the knitting front, despite that fact that I'm pretty sure she knows I'm one of the world's slowest knitters, Helen is letting me test knit Daedelus for her. I've barely begun. One of my co-workers is greatly amused by the idea of test knitting. Today, he was trying to decide what kind of uniform test knitters should wear -- jumpsuits, with lots of patches, and Raybans, like test pilots? We finally decided that a hand-knit sweater and socks would be more appropriate! Flame retardant suits? or only if your pattern writer is a total nutcase?